So it's mid-May, I've moved on from spring, and I'm officially in full-on summer shopping mode. 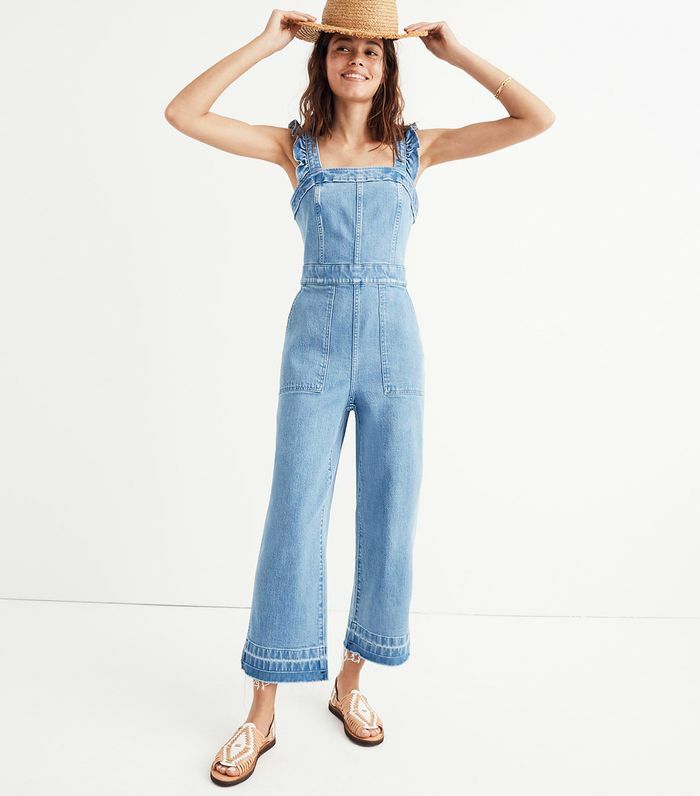 Five days ago, while perusing Madewell's latest batch of new arrivals (of which there is so much good stuff), I spotted a new ruffle-adorned denim jumpsuit with a waiting list that was available for purchase with a ship date later this month. I'm always hesitant to buy pieces that are on a waiting list (because the keyword here is "wait"), but I decided it was cute enough to be worth it. I went back the next day to buy it in my size and it was sold out, along with basically every other size. Madewell had already labeled it as a best-selling item before it was even available, so I guess I wasn't alone in my admiration of the jumpsuit. So what's so great about it? It's stretchy (comfort! ), flattering (thanks to the cropped-flare silhouette), and it's the perfect canvas for basically every tee, accessory, and pair of shoes I plan on wearing this summer. Since then, I've refreshed the item's page more times than I can count in hopes that Madewell will add more stock or someone will cancel their order (hey, it happens! ), and no such luck. But don't worry, as I don't give up easily. Check out the ultra-popular jumpsuit below and shop other Madewell new arrivals I'm stalking. These are the most flattering white jeans I've encountered lately. So into this happy color. Strawberry season is the best season. You won't believe how soft and comfortable this is. I can never resist a good boxy tee.